The continued rise of Pegida sees no sign of slowing down in spite of continued counter-protests and political condemnation in Germany. The twelfth consecutive march was their largest and capitalised on the collective grief many feel in the wake of repeated terrorist attacks in Paris. Dresden police put the figure at 25,000 people as organisers claimed the true figure was closer to 40,000. Either way, both figures dwarf the 18,000 who attended the ‘anti-Islamisation’ rally a week ago. Amid a sea of flags, one read “Yesterday Paris, tomorrow Berlin, no to religious fanaticism,” a slogan that typifies the Pegida movement – a movement that exploits a fear of Islamist-inspired terrorism, economic disparity, and the cultural anxieties around German identity in the age of globalised migration. Pegida rallies against multiculturalism, ‘favourable’ asylum and migration policies. The clue is also in the name ‘Patriotic Europeans Against Islamisation of the West,’ which positions Islam at odds with traditional “Judeo-Christian” values. Cultural nationalism helps solidify its support within far-right circles. Police sources suggest hundreds of Pegida supporters are far-right linked hooligans from HoGeSa or Hooligans against Salafists. Some yell “Press liars” at journalists – a phrase that harkens back to the Nazis. Pegida demands integration as a means to absolve the fears supporters hold around Islamisation, alienation and a perceived loss of Germanic culture. Points that presuppose Muslims in Germany do not already integrate. A demand that reduces complexities into rigid binaries. Binaries that will potentially alienate Muslims in the country. Nor must we dismiss the problems these issues raise but Pegida’s rhetoric is anything but helpful. The group also demands an end to ‘war-mongering’ with Russia. Dresden is Pegida’s powerbase, a success partly fuelled by its ability to shape perceptions and manipulate cultural anxieties around Islam – Dresden, capital of Saxony, has a Muslim population of just 0.1 per cent. Just 2.5 per cent of individuals in the area are from migrant backgrounds. Others view Pegida in strictly populist terms and find the protests offer a sense of empowerment in disempowering times. In a strictly German context, Pegida potentially re-opens old wounds as the economic scars of the historic East/West divide still permeate. To re-engage disaffected political voices means sacrificing Germany’s recent and remarkable openness to migration and asylum. In 2014, the country received almost 200,000 claims for asylum in 2014 (up from 127,000 in 2013), including from those fleeing conflicts in Syria and Iraq. A far-right linked arson of proposed asylum centres highlights how some exploit tensions. Externalising Islam (and Muslims) as a threat to Germany identity and culture creates a range of problems. A recent survey suggested that 57 per cent of non-Muslim Germans consider Islam a threat. Viewing Islam through the prism of race helps crystallise a sense of the ‘other’. The largely Muslim Turkish community (the largest minority in Germany) speak of a growing unease around Pegida. Others view halal meat, Sharia law, and the veil (e.g. the burqa and niqab) as cultural threats and potential signifiers of an impending Islamisation – a conspiracy theory that provides simple answer to the complexities of indentity. One poll found 34 per cent of Germans believe their country is going throw a process of Islamisation. For Muslims, this marginalisation, social frustration and religious tension may push some into the eager hands of terrorist groups such as ISIS. A 2005 Congressional Research Service in the United States made similar claims. Others will simply look for an excuse to join, say ISIS, to fulfil some nightmarish validation through unjustifiable acts of violence. Many who experience varying degrees of anti-Muslim prejudice and marginalisation do not resort to violent solutions. But the idea that Pegida is a ‘lightning rod’ for ISIS recruitment is rejected by Germany’s embassy in Washington. Previously, she stated: “There is no place in Germany for Islamophobia or antisemitism, hatred of foreigners or racism”. Others likened Pegida to ‘pinstriped Nazis’’. At a street-based level, counter-protests often outnumber Pegida-inspired groups. Yet it merely reflects the demographic differences of cities that economically benefit from increased migration. In Leipzig, the offshoot ‘Legida’ movement attracted 5,000 supporters but the counter demonstration stood at 30,000 people. Other cities (including Munich and Berlin) again recorded higher numbers of counter-protesters than Pegida-inspired demonstrations. Counter-protests do exist in Dresden but are often smaller. In spite of that, a weekend protest in rejection of Pegida numbered 35,000. The challenge is to match these numbers when Pegida holds its annual rally. Nor must we view Pegida in isolation. Pegida’s populism around Islam and migration merely translates wider anxieties into a tangible non-violent protest movement. In Germany, and other parts of Europe, anti-Islam sentiment finds mainstream acceptance in some political and media circles. Others make the accusation that a poisonous drip of ‘mainstreaming’ of racist rhetoric potentially encourages violent right-wing responses. In the theatre of non-violent politics, Alternative for Deutschland (AfD), a right-wing Eurosceptic party, takes a positive view of Pegida. Merkel’s own party, the Christian Democrats (CDU), take an inconsistent stance on the movement – some call for more understanding of their root support as others warn about a potential AfD alliance. Nor should these anti-Islam sentiments be compartmentalised within Pegida and broader far-right movements. Various polls reflect the cultural insecurities some Germans feel about Muslims and by extension, what role, if any, Islam has in their country. Opinion polls also find broad German support for immigration but a growing minority call for tougher immigration rules. The ARD television station produced a poll that found 21 per cent had sympathy for Pegida (76 per cent did not). 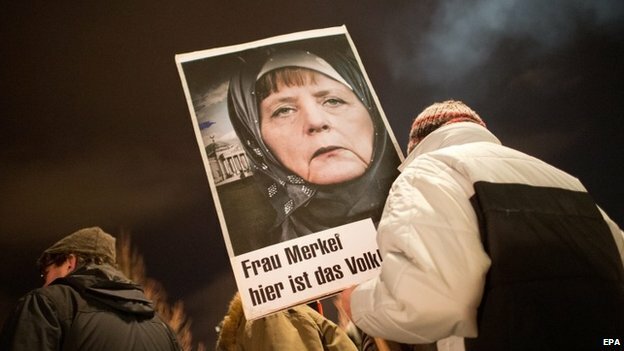 Anti-Muslim sentiment also existed in Germany prior to Pegida. Pegida’s populism taps into a broader political mistrust and demonstrates how political condemnation does little to assuage numbers. The mainstream must accept some blame for creating the space Pegida now occupies (and that makes tangible political solutions harder). Other movements in Europe now seek to copy the Pegida model (but some will have trouble replicating the numbers).